Glasgow has recently installed CityTrees on Royal Exchange Square and Killermont Street. 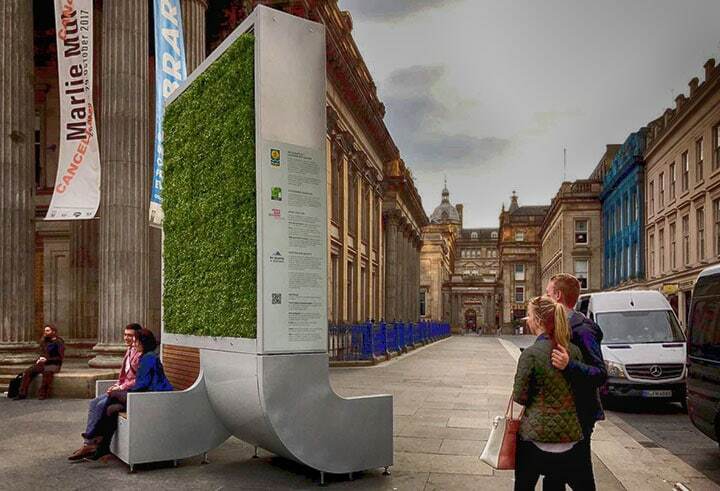 Glasgow is the first UK city to have CityTrees installed in key city centre locations. Their arrival is a major boost for the city. 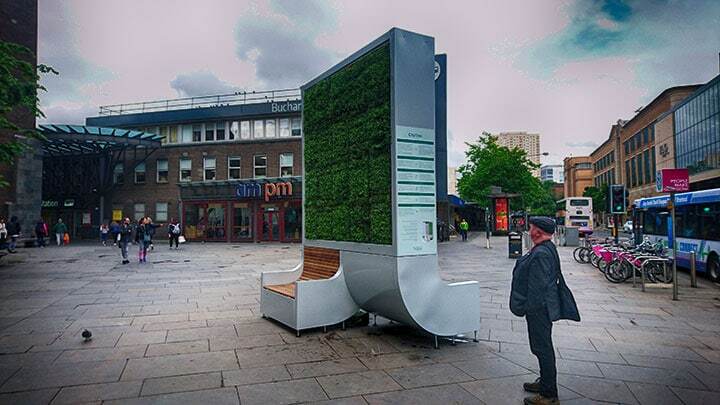 Created by Berlin-based Green City Solutions, the CityTrees contain a plant mixture of mosses and vascular plants which provide environmental benefits and introduce additional “greening” to the city centre by removing dust and nitrogen dioxide from the air. The CityTrees include information panels which provide technical details about the installations and advice on air quality, health, and sustainable travel. The installations are largely self-maintaining, with solar panels providing power for irrigation and sensors which monitor the plants and the surrounding environment. Rainwater is also gathered and recycled through the irrigation system. In addition to providing stability, the benches on both sides of the CityTree provide convenient spots to watch the world go by. Glasgow supported the UK’s first National Clean Air day on 15 June 2017 to encourage people to take simple steps to improve their health and reduce air pollution. The award winning 1 City Centre Mural Trail, funded by the City Centre Mural Fund, has continued to grow and attract attention and interest. The much-loved art project has been enjoyed by residents and visitors alike, with enquiries being received from as far as New Zealand, USA and the Middle East and Smug’s recent St Mungo mural receiving well over a million hits on social media in its first few days after unveiling. Hundreds of travel blogs are promoting the mural trail and hugely supportive articles have also assisted in this, including Conde Nast and the New York Times, amongst others. 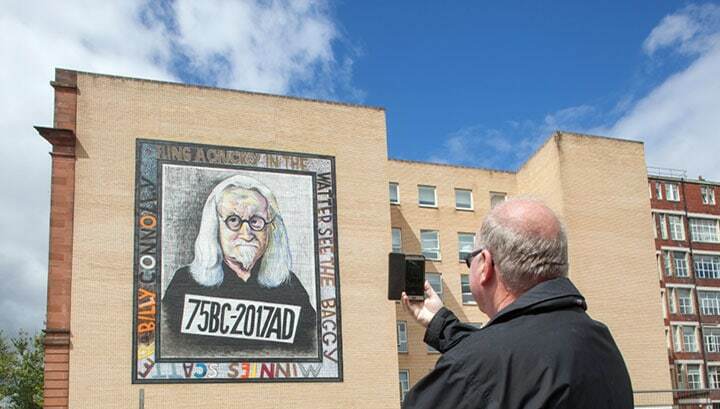 The project gained national attention recently with the addition of three new murals celebrating one of Glasgow’s greatest loved comedians, Billy Connolly, on his 75th birthday. 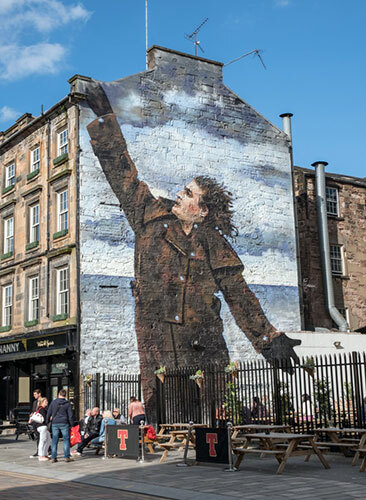 The 3 pieces of artwork were created by contemporary Scottish artists John Byrne, Rachel McLean and Jack Vettriano and left their unique mark across the city centre as murals, as shown on BBC Scotland programme Billy Connolly: Portrait of a Lifetime. You can find these new murals at Osborne Street (John Byrne) and Dixon Street (Jack Vettriano) and Rachel McLean’s vinyl replica in the Gallowgate. We are pleased to note that many spin-off benefits of the murals are happening including the development of small businesses who offer walking tours and guidance on the murals and surrounding attractions. 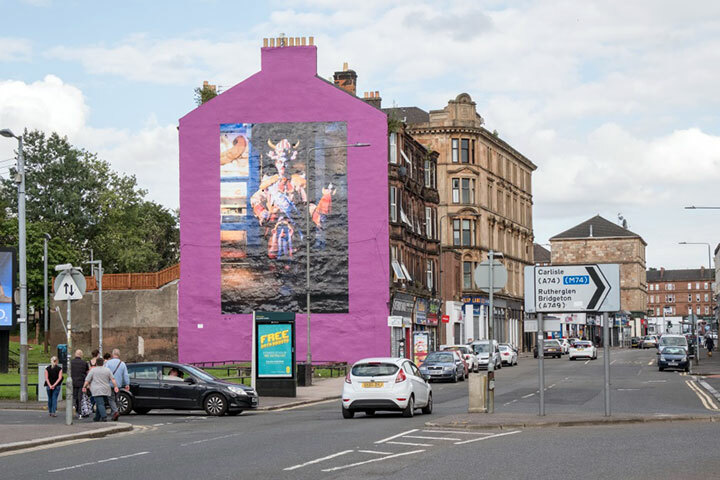 For people wishing to complete a guided tour of the Mural Trail, Photo Walk Scotland has their Glasgow Street-Art Tour, giving their participants photographic tuition along the way. The tour has 5* accreditation from Visit Scotland and received a Certificate of Excellence 2017 from Trip Advisor. A new Mural Trail smart phone app and website have also been developed.